* Alexander Whittell's religion - Prot. * Rachael Whittell's religion - Prot. * Children: Elizabeth 9 mos. "Index to Bounty Immigrants Arriving in N.S.W. Australia, 1828-1842," indexed database with record images, FamilySearch (https://www.FamilySearch.org), Volume 38, Alexander and Rachel Whittell entry. This card is a typed abstract from the handwritten passenger lists, which are probably available in the State Archivesin Sydney. 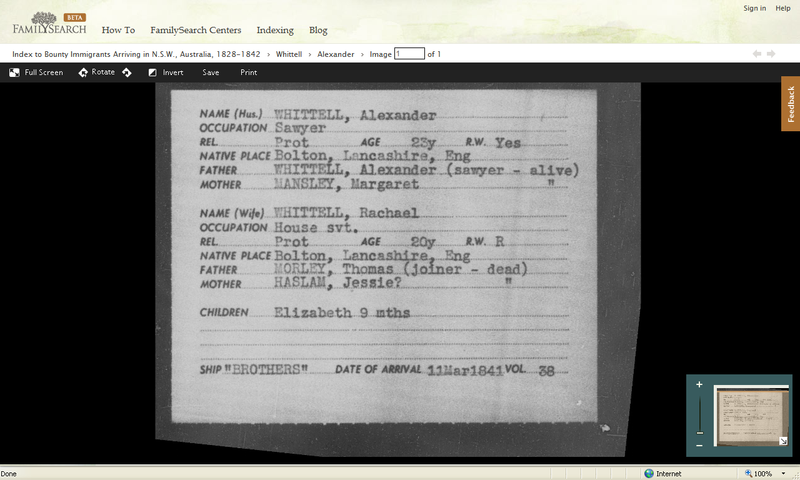 The typed cards are available on FamilySearch Digital Microfilm in the FamilySearch Catalog here. They are searchable, and are in the "Australia, New South Wales, Index to Bounty Immigrants, 1828-1842" record collection. This card provided the major breakthrough in the Whittle research because it provided the location of the birth of Alexander and Rachael, plus their parents names, and other information. Alexander and Rachael (Morley) Whittle are my wife's second great-grandparents, through their daughter, Jane (Whittle) McKnew (1847-1921).